Researching Food History - Cooking and Dining: Lolling and the "boarding house reach"
Lolling and the "boarding house reach"
Reaching across 3 or 4 people for a dish "is not only vulgar, but inconvenient." FOUR persons - what a loooong boarding house reach! Before there was 'lolling about' there was lolling. The American edition of Chesterfield's contained several new rules written by a Philadelphia lawyer in 1828. "Another violation of decorum, confined chiefly to taverns and boarding-houses of an ordinary class, is that of reaching across a table, or across three or four persons sitting next to the person who wishes for some particular dish. This is not only vulgar, but inconvenient. It is a sure sign of having been accustomed to low company; and should be avoided, by every one who is ambitious of being thought a gentleman. 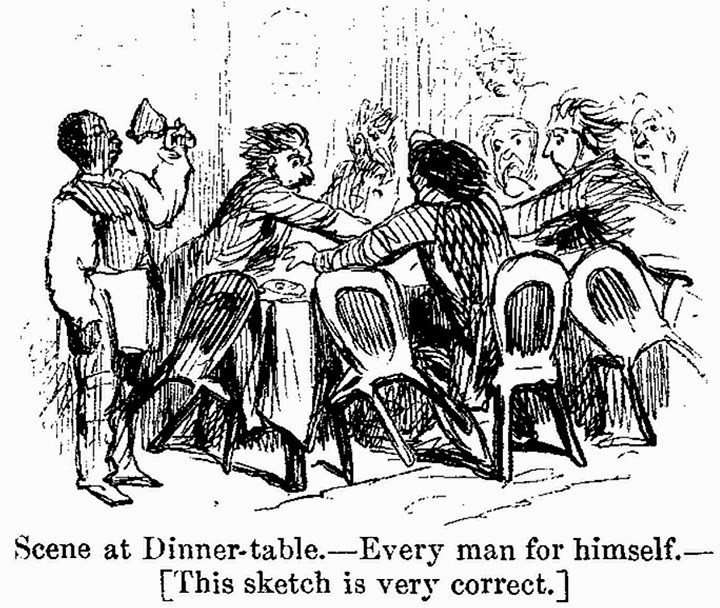 The offensive practice of carving with one's own knife and fork, and of using one's oven knife or spoon, when wanting salt or sugar, does not call less loudly for amendment; but cannot always be dispensed with, unless the mistress of the house will be careful in performing her duty, by seeing that the table is fully provided with such things as a decent table requires. There is another habit, peculiar to the United States, and from which even some females, who class themselves as ladies, are not entirely free.—that of lolling back, balanced, upon the two hind legs of a chair. Such a breach of good-breeding, is rarely committed in Europe. Lolling is carried even so far in America, that it is not uncommon to see attorneys lay their feet upon the council table; and the clerks and judges, theirs also upon their desks, in open court. But, low-bred and disgusting as is this practice… Much injury is done also to the paper-hangings of a parlour, by the practice of balancing on the hind-legs of a chair. By this reprehensible indulgence, as well as sitting too near the wall, the paper becomes, in a short time, marked, all round, with grease; exhibiting a most unsightly contrast to the freshness and splendour of the rest of the paper; and compelling the owner of the house to renew the hangings, in less than half the time that would have been requisite, had his visitors been more careful.